I am half asleep on the massage table, the masseuse kindly asks “where does it hurt?” I think to myself “the good question would be where am I not in pain …”. A poor fellow is on a stretcher next to me, my guide is “discreetly” throwing up in the background, wow, that was a tough day. This morning we took a bus to the starting line, we drove 26.2 miles from Boston, and guess what, it was a long drive! It was quite demoralizing actually. I wasn’t ready for this marathon, so I decided to run smart and see how things go. By the way, when I say “run smart”, what I really mean is slow. It was much warmer than I had anticipated, which is good for the spectators, not so great for the runners. There were lots of college kids going crazy during the first few miles, it felt like March Madness, I knew that this 120th Boston Marathon would be a fun day! I especially loved passing by the semi-official water stops, with spectators handing out bottles of water, kids giving us candies, it was adorable. There is nothing like the first half of a marathon, the legs feel good , the crowd is amazing, I felt unstoppable. My second guide joined us at mile 11 with fresh legs, right before Wellesley College. We could hear the incredible roar of the crowd literally from a mile away, it was intimidating. 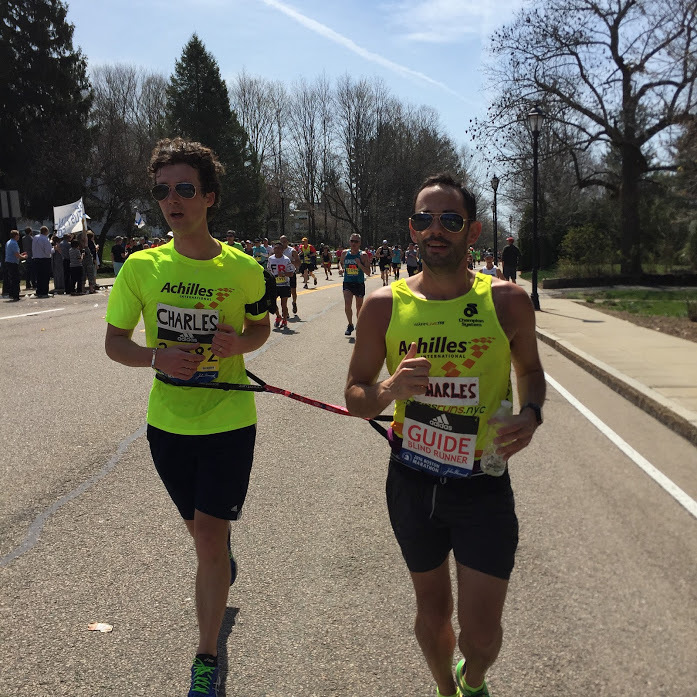 I had my name on my bib and as soon as the ladies of Wellesley saw us, we ran to the sound of hysterical “I LOVE YOU CHARLES!”. As you can imagine, I blew kisses to the crowd, I smiled, oh I will never forget you girls, for a few minutes, I felt like a rock star. But another race was about to start, the Newton Hills were dead ahead. I lifted my chin, pulled my shoulders back, I wanted to face my enemy with all the dignity left inside me. Those next few miles are a big blur in my mind, I just remember that I let the hills do what they wished with me. I was so afraid of Heartbreak Hill that it didn’t feel as difficult as I had feared. But the final 5 miles were terrible! I thought that it would be a nice downhill and it was pure torture, I was totally spent. That’s when things got ugly. I started to be disoriented, I kept bumping into Matt, a painful reminder that any marathon finish is an incredible achievement. By then I knew that I wouldn’t finish under four hours, I promised myself that I would come back and honor this race with a great preparation and a better time. But I still had a few miles to go! We kept passing people in agony, I wanted to cheer for them, but all I could do was moan. My dignity was long gone, all I wanted was the finish line. We made a left turn, and here we were, this was Boylston street! Oh I took my time, I could finally lift my arms, celebrate with the crowd, I was about to add my name to the prestigious list of the Boston marathon finishers. The world was so perfect at this very moment. But we crossed that ineluctable line, right away my legs couldn’t carry me anymore, I needed to hold on to my friends to stay up. I gave everything I had to this race. My masseuse asks me to turn around, I can barely move. My medal is there, a beautiful reminder that this wasn’t just a dream. Great report as always, lifly and with that “Charles ” zest of humor. We can feel your anticipation at the beginning of the race, your enthusiasm in the middle and your pain at the end. What a victory, you’re a STAR !!! Great race report – I really have to do this race one day!